PURSUE YOUR WINTER PASSIONS BEHIND THE WHEEL OF A NEW AUDI FROM AUDI ANCHORAGE. Snow and ice are no match for Audiâ€™s legendary QuattroÂ® all-wheel drive, so get ready to take your winter fun to a new level behind the wheel of a new Audi from Audi Anchorage. As Alaskaâ€™s only Audi dealer, we are proud to bring you a full line-up of the greatest vehicles available for navigating Alaskaâ€™s amazing summers and even better winters! We have an amazing selection of new Audi models to choose from. We invite you to stop by to test drive any new Audi QuattroÂ® SUV, Luxury Sedan, or Sport Model and see for yourself why Audi Anchorage is your Alaskan driving headquarters. 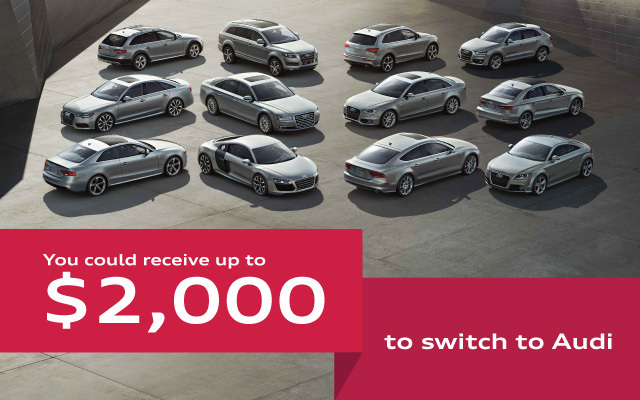 We have terrific lease offers available on every new Audi in stock. Take advantage of these great offers and be winter-ready before the snow falls. Fall in love with your home state a little bit more behind the wheel of a new Audi from Audi Anchorage. We make exploring Alaska fun, easy and AFFORDABLE. *New 2015 Audi Q7 3.0T Premium AWD Quattro. Stk# PA1356. MSRP $59,700. $1000 Lease Bonus Cash available for those who qualify. Must finance with Audi Financial services to receive bonus cash. Lease term 36 months with monthly payment of $544, not including applicable taxes and fees. $5,000 due at signing, no security deposit required. Cap cost $4456 Residual value of $34029, acquisition fee of $625, total of payments $24,040. Based on 7500 miles per year, $.25 cents per mile over limit. Lease end disposition fee $350. Tier A credit may be required to qualify for this offer, all financing on approved credit. Price includes dealership documentation fee of $199. Tax and license fees are not included. Subject to prior sale. See dealer for details. Offer expires 9/30/15. **New 2015 Audi Q5 2.0T Premium AWD Quattro. Stk# PA1330. MSRP $41425. $500 Lease Bonus Cash available for those who qualify. Must finance with Audi Financial services to receive bonus cash. Lease term 36 months with monthly payment of $299, not including applicable taxes and fees. $5,000 due at signing, no security deposit required. Cap cost $4701 Residual value of $24026.50, acquisition fee of $625, total of payments $15465. Based on 7500 miles per year, $.25 cents per mile over limit. Lease end disposition fee $350. Tier A credit may be required to qualify for this offer, all financing on approved credit. Price includes dealership documentation fee of $199. Tax and license fees are not included. Subject to prior sale. See dealer for details. Offer expires 9/30/15. ***New 2016 Audi A3 1.8T Premium 4WD. Stk# PA1355. MSRP $35600. Lease term 36 months with monthly payment of $249, not including applicable taxes and fees. $5,000 due at signing, no security deposit required. Cap cost $4751 Residual value of $21360, acquisition fee of $625, total of payments $13715. Based on 7500 miles per year, $.25 cents per mile over limit. Lease end disposition fee $350. Tier A credit may be required to qualify for this offer, all financing on approved credit. Price includes dealership documentation fee of $199. Tax and license fees are not included. Subject to prior sale. See dealer for details. Offer expires 9/30/15. 1New 2015 Audi A6 2.0T Premium AWD Quattro. Stk# PA1245. MSRP $51075. Lease term 36 months with monthly payment of $393, not including applicable taxes and fees. $5,000 due at signing, no security deposit required. Cap cost $4607 Residual value of $27069.75, acquisition fee of $625, total of payments $18755. Based on 7500 miles per year, $.25 cents per mile over limit. Lease end disposition fee $350. Tier A credit may be required to qualify for this offer, all financing on approved credit. Price includes dealership documentation fee of $199. Tax and license fees are not included. Subject to prior sale. See dealer for details. Offer expires 9/30/15. 2For an owner or a member of an owner's household where a model year 2001 or newer BMW, Lexus, Mercedes-Benz, Acura, or Infiniti vehicle is currently registered (proof of ownership/registration is required). Limit one incentive per eligible VIN. 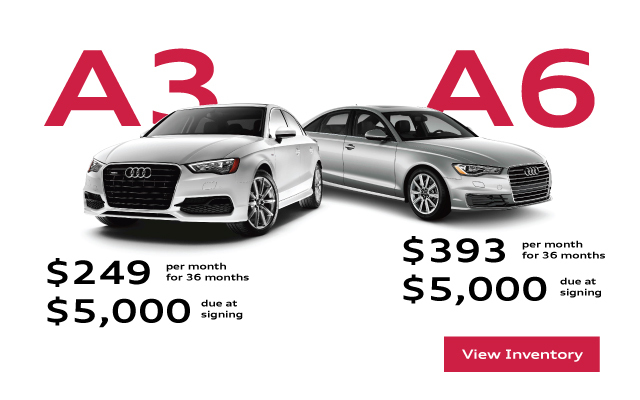 Audi of America, Inc. will pay between $500 and $2,000, depending upon model, towards the lease or purchase of a new, unused 2015/2016 A3 or A3 TDI Sedan, A3 Cabriolet, A4 or S4 Sedan, A6, A6 TDI or S6, A8 or A8L or A8L TDI or S8, including TDI clean diesel models. Offer not available on 2015/2016 S3 Sedan and A8 L W12. No trade-in required. Offers are non-transferable. Not redeem able for cash. Incentive paid to dealer and requires dealer participation. May not be combined with Demonstrator, Service Loaner, or Audi Owner Loyalty Programs. 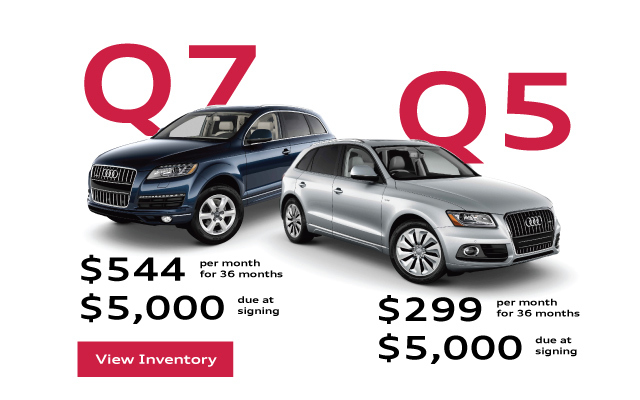 See your Audi dealer for incentive and financing details, or, for general product information, call 1-800-FOR-Audi. All offers end October 1, 2015 (Audi of America 'Audi Acquisition Program' Bulletin 15-N-0067). Â©2015 Audi of America, Inc. Contact dealer for full details. To opt-out, please [~Optout style="color:#555555;"~]click here[~EndOptout~] or you can write to the address below. We will remove your email address from all future offers on behalf of Take 5 Media Group. We encourage our readers to look at our PrivacyÂ Policy.